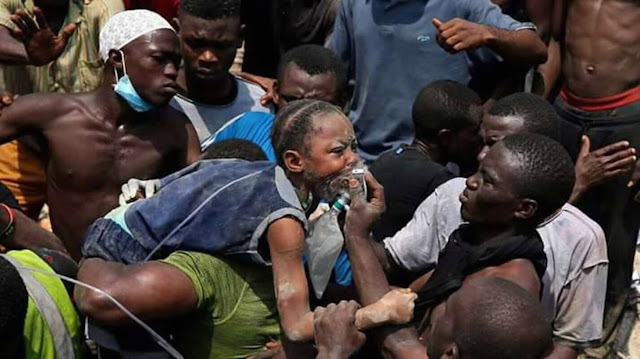 According to Africa News official figures released by the state health commissioner in Nigeria’s commercial capital, Lagos, on the casualties from the four-storey building that collapsed on Wednesday, March 13, 2019. “Twenty corpses were brought to Lagos state mortuaries from the site, 45 survivors were received and were managed by government health facilities,” commissioner Jide Idris said in a statement. While the rescue operation came to an end on Thursday, authorities in Nigeria are yet to give a final death toll and breakdown of casualties after a four-storey building housing a school, homes and shops collapsed on Wednesday. Adebayo Kayende, spokesman for the Lagos state emergency agency, said the Lagos state ministry of health was checking with hospitals and once they had finished counting those dead the details would be made public. According to reports parents were angry because people had complained about the building for the last 12 years. A spokesman for the National Emergency Management Agency’s southwest region said casualty figures were not yet available but that many people including children were believed to be trapped. “It is believed that many people including children are currently trapped in the building,” he said. The third floor of the building housed a private school in the area. The three-storey building came down at around 10 a.m. local time.